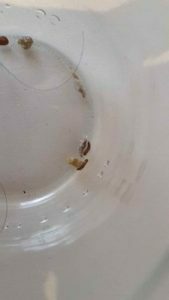 We believe these are carpet beetle larvae. 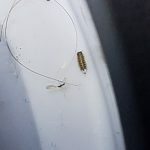 Carpet beetle larvae are notorious household pests and we are quite familiar with their sneaky ways and destructive eating habits! 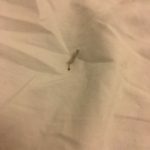 Since carpet beetle larvae eat basically everything, we don’t know if they are feeding on the press-board bed frame and shelves, or on the bedding itself and other materials in the closet. They are known to eat wool, feathers, fur, as well as other various fabrics, but it is surely possible they are munching on the press-board. 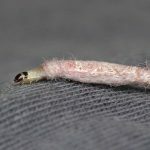 To get rid of carpet beetle larvae, our reader will need to remove anything that has been damaged by them and either dispose of it or have it professionally cleaned. She should investigate all of her bedding as well as everything in the closet in search of evidence of these larvae. 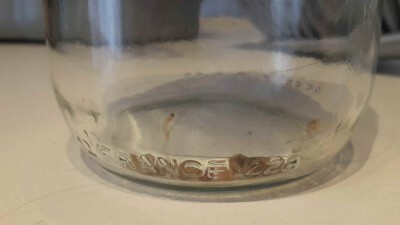 Once the food sources have been removed, our reader will need to stick to a daily cleaning regime to get rid of any remaining larvae and potential food sources. This involves sweeping, dusting, vacuuming, scrubbing, and doing laundry for 2-4 weeks. Although it may seem excessive, it is the only way to eliminate larvae and to keep them from coming back! 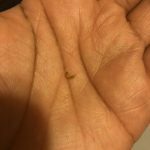 These larvae might be annoying but luckily they aren’t dangerous or harmful. 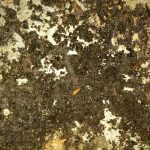 To conclude, we believe the organisms chewing through our reader’s home are carpet beetle larvae. 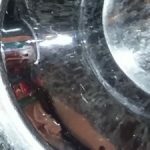 For more cleaning tips for getting rid of these specimens, our reader can check out this article. 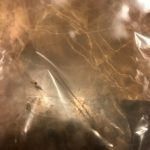 We believe the organisms chewing through our reader's home are carpet beetle larvae. 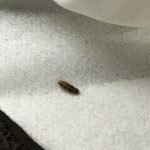 For more cleaning tips for getting rid of these specimens, our reader can check one of our various articles on carpet beetle larvae.